This cover reeks of poor life decisions. King’s Quest: Quest for the Crown wasn’t the only antiquated computer port making the Master System rounds back in ’89. Montezuma’s Revenge – an early pre-Super Mario Bros. platformer – was ported also, after first being released in 1984 for Apple II, Commodore 64, etc. Presumably, Parker Brothers – who published both Montezuma and King’s Quest for Master System – did so because the games were easy/cheap to port. But was any Master System gamer fiendin’ for some old computer games? Far be it from me to speak for those who owned the console in 1989, but surely they would have preferred games that could compete with the NES and not make the Master System they purchased look like a fool’s investment? You play as Panama Joe, an explorer with a pitiful stomach condition and a thinning crop of hair. Joe explores a 100-screen pyramid, not once, not twice, but up to eleven times, depending on how much you enjoy rummaging through old tombs. At the beginning of the game, you’re asked to choose your level of difficulty. While you can only choose up to level 6 at the beginning, if you beat 6, level 7 opens, then 8, etc. Level 1 is the gentlest iteration, even going so far as to block off sections of the pyramid. But by Level 3, the entire pyramid is on display, ready for you to explore, get lost, step in snake crap, etc. Even on level 1, though, the pyramid doesn’t take many screens before it gets fierce. Disappearing/reappearing floors, conveyor belts, bats that whisk you off the screen, rolling skeleton heads, ropes that burn underneath you, and flame pits are just some of the terrors that await Joe. Is that torch really worth it? But what’s the point of all this exploring? Why, treasure, of course. Treasure which turns into points which turns into extra lives. And keys. Lots of multi-colored keys, a la the SG-1000 classic The Castle. Each room is a series of platforming obstacles that prevent you from collecting said keys to open more doors to more rooms to more treasure to more keys and oh my I got the panama sweats. In both structure and design, the game is exactly like The Castle. 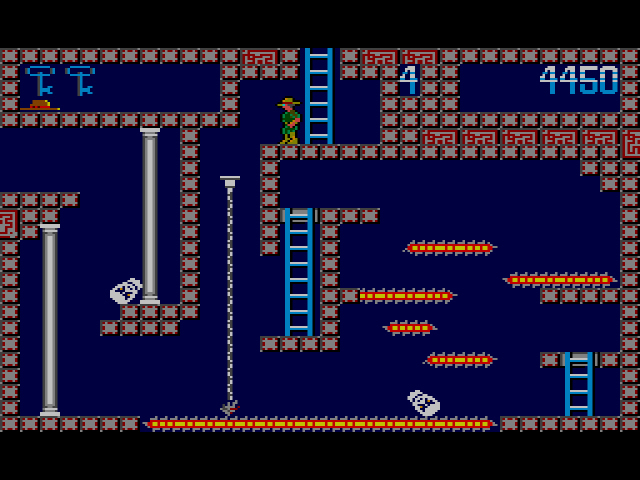 Or, rather, The Castle is exactly like Montezuma’s Revenge, as the former released two years after the latter. “This Old Pyramid” featuring your hosts, Panama Joe and The Hiss Twins. I loved exploring the rooms of The Castle, but I’m not too fond of ol’ Panama Joe’s antics. Like other early platforming heroes – Mario in Donkey Kong, Spelunker in Spelunker – Joe can’t withstand a fall of more than a centimeter (I’m slightly exaggerating… slightly). And while this sort of weakness was acceptable in 1984, Mario’s god-like jumping powers in Super Mario Bros – these that allowed him to jump as high as he liked with zero consequences upon landing – changed the platforming game forever. 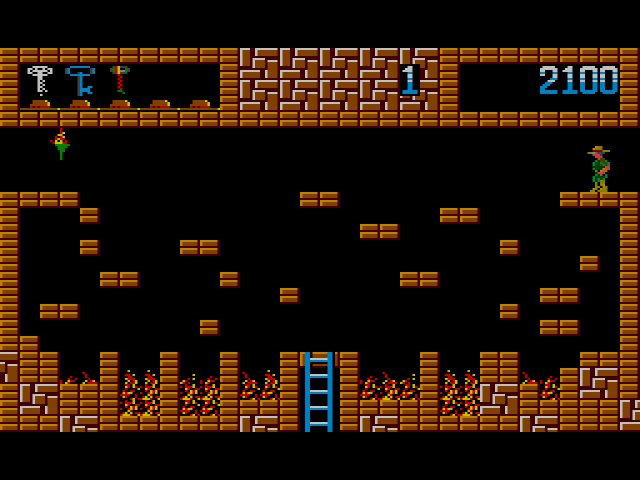 Considering that, in the Master System port, Parker Brothers added new elements to the higher levels, included text descriptions with each level, and gave the graphics an 8-bit spit shine, you’d think they might offer even a little leeway with the jumps. But no, Joe’s as lame as he ever was, and the port is all the worse for it. Oh, the long and wasted years. The innumerable deaths (thanks to Joe’s inability to fall properly) kill this game for me. 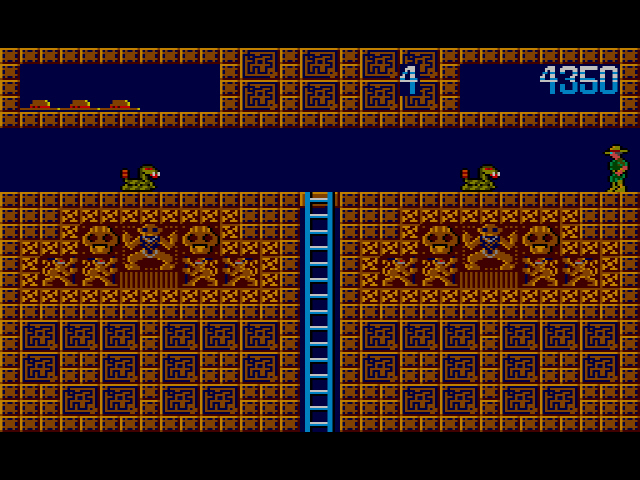 But if you have a soft spot for Montezuma’s Revenge, the Master System version is the way to go. The pyramid’s eleven levels are plentiful, the rooms and puzzles are well-crafted, and the additional content is a nice change for those who’d played the game already on the computer. Do you like exploring inessential new versions of old games? Montezuma’s Revenge is for you. I, however, would rather play just about anything else. Montezuma’s revenge was my first platformer that I played in my life. I remember with fond those days of loading cassettes in my atari 800xl. Clearly this game has not aged well, but still I play it sometimes for the old times. I think I would feel differently towards the game if I was playing it on an old computer. So does this game have an ending, or does it just loop back around to the start? A big final boss would be kind of neat after all that treasure stealin’. Just one big loop around, as far as I know. The text that hints at ancient evil bosses is pure lies. This is the type of release that killed the Atari 7800. Old games just with better graphics when the world had moved on to a new gameplay style. 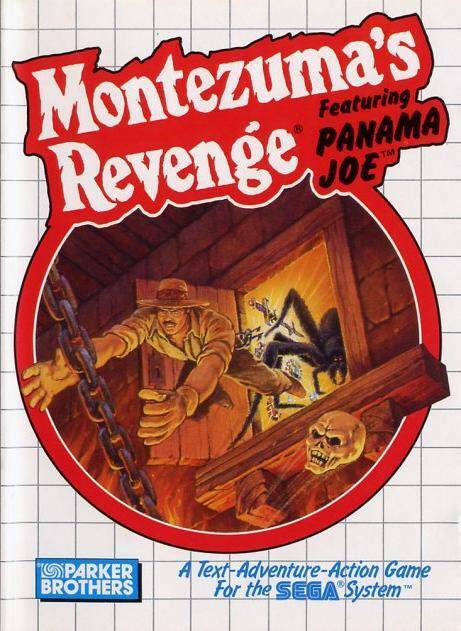 As a curious fact, here in Chile , this game was a huge success in the Atari days, but here Panama Joe was known as Pedro (that was the name stated in manuals and magazines) or simply as the montezuma’s guy. This was one of my favorite SMS games as a kid. Boo-urns to you sir for not loving it! Boo-urns I say! Also, it shouldn’t lose points just for being a port of an old game (especially when they went to the trouble of dolling it up). Video game companies have always rereleased older games on newer platforms and still do it to this day, and often times those rereleases end up being the best version of a game (and has the added benefit of introducing more people to a game they might otherwise have known about). It doesn’t lose points for being a port of an old game. It lost points because I really don’t like it. I remember playing this game on a friends C64 and liked it. I remember seeing that is was coming out on the Master System was was excited. I never picked it up when I was younger but finally picked it up a few years ago. I still think it is fun but is just one of those games you need to keep playing and memorize the levels. I think your score is close but I probably would have given it a D+/C-. I loved playing this game years ago on the family PC. I’d like to find this version someday as well, because I would be really curious to play it and see how it compares to the PC version. It always felt awkward trying to play a platformer via a keyboard (Duke Nukem and Commander Keen nothwithstanding), so I would be really interested to get my hands on this one. 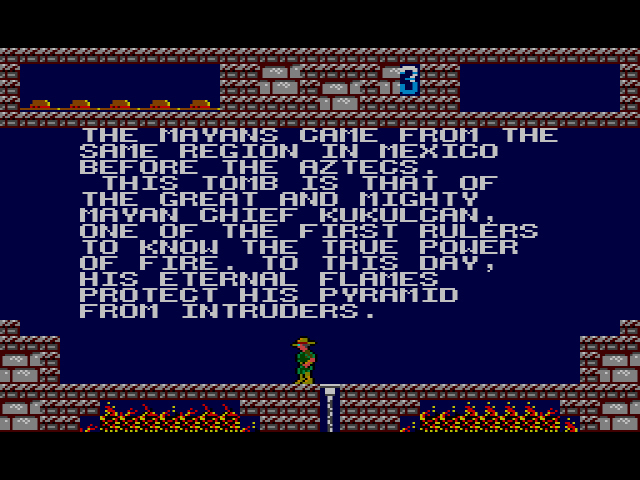 The Apple II version of Montezuma’s Revenge was one of the first games I ever played, not that I got anywhere. I think I still prefer it over the SMS version, which controls a bit clunkily. I like the game, but it’s definitely a triumph of nostalgia over relevance. There’s a crappy GBC sequel, by the way.